I love the beach. I live right near one and as the weather warms up, there is nothing more glorious than walking the golden shores and sinking into the cool water. But it hasn’t always been a comfortable fit. The beach always seemed to be a white people place, like the fictional Home and Away, filled with chiselled blonde bodies, far away from Sydney’s western suburbs where I grew up. I remember awkward outings as a kid to the coast with waddling Aunties in voluminous shalwar kameez who would lift their loose shalwar to dip a foot in the water before running away to eat pakoras. We ethnics were no good at water things and especially for girls, it was never encouraged. On the other side of the equation, hairless bikini babes only please. 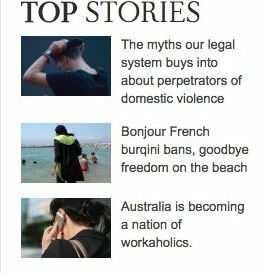 When the Cronulla riots broke out in Australia in 2005 it seemed to confirm the metaphor of the beach as a kind of cultural battleground welcome only to a certain kind of person; the last glorious Anglo frontier against the dreaded Muslims. The riots have been endlessly analysed through the lens of race, with gender in the background. Most of the rioters were young white men going mad in a kind of macho posturing over women and property centred around protecting “our things” (white women, beach) from “them” (the not white, strangely clad interlopers). This in itself reflected a problematic male entitlement that gets to dictate the norms and responds with violence at perceived infringements of power. Then the ‘burqini’ came along. The burqini was an ingenious Australian invention that facilitated swimming for conservative women who observe Muslim modesty guidelines. Some of my good friends are burqini babes. They are lawyers and academics, mums and corporate executives, some are even swimming instructors. 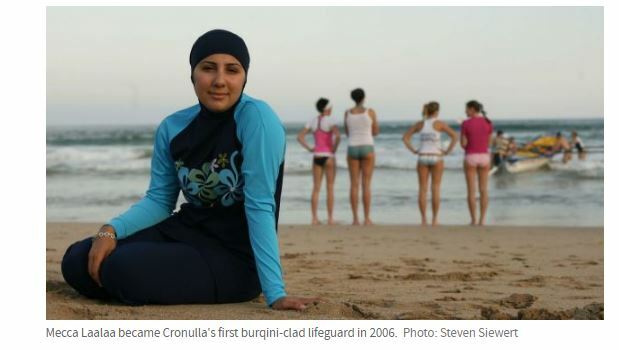 In 2006, Mecca Laalaa became the first burqini-clad Muslim woman in Australia to become a lifeguard, trailblazing a road for Muslim women to not only participate but own the surf. It reminds me of the last scene in Puberty Blues, a coming of age story of teen girls set in the 1970’s Sydney Shire, when the girls decide to go from being spectator eye candy to grabbing surf boards and diving into the ocean against cries of the astonished boys yelling “chicks don’t surf”. And it’s not just Muslim women who want to surf in these suits – the exquisite Nigella Lawson once famously sported a burqini for sun protection. For those who want to remain fair and lovely or don’t feel comfortable with the body beautiful display otherwise required on the beach, various forms of the suit gives freedom to frolic with joyous abandon. All good right? Wrong. A swimsuit that encourages those of all shapes, sizes and backgrounds to participate, have agency and be physically active and comfortable should be a win for all women right? Wrong again. In France, anyway. The French mayor of Corsica has reportedly become the third in the country to announce a ban on burqinis, following weekend clashes fuelled by a row over the outfit, sparked by a man incensed over a photo taken of one of his party – a burqini clad woman. The oddly named French Women’s Rights Minister failed to oppose the move, having previously spoken against the “archaic” garment. Now these women who were perhaps even braving the disapproval of the more conservative in their own community will be back to watching from the shoreline. They will be exactly where the right wing French and Muslim fundamentalists like them to be, on the sidelines – all in the name of their freedom and dignity of course. I’m sure the ban will be a liberating experience for the Minister; because banning things and policing a woman’s access to the public space is always a great celebration of freedom and a good answer to male violence. Vive la France! Once again, it is women who pay the price and are the pawns used in the cultural battleground between knuckleheaded men and the wider violence of a male dominated state apparatus. An apparatus that echoes the values of those in power, with the faint whiff of former European colonial overlords straining to accord equal status to the subjects they once ruled over. 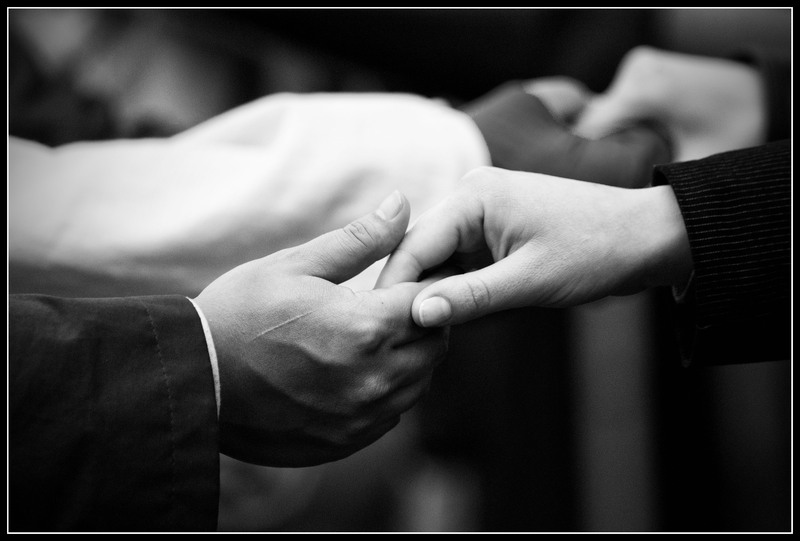 The message is clear; your belonging here is conditional, engage only our terms or not at all. The ban is an attack on minority communities, already subject to increased surveillance and harassment, who occupy the very bottom of the social hierarchy; and its most vulnerable members – Muslim women. Women who not only have to navigate sexism within their communities, but also the brute force of state authorities intent on crushing their autonomy – and rendering the men in their lives humiliated and impotent against these incursions. All for ‘freedom’, in the most Orwellian sense of the word. This article originally appeared in the Sydney Morning Herald’s Daily Life website on August 17, 2016. Pakistan has a new feminist superhero. Her weapons of choice are books, pens…and a burqa. Recently I was interviewed by Melissa Wellham from Mamma Mia on my thoughts on the burqa-clad heroine. 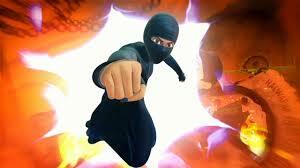 For those not familiar with the Burqa Avenger, she is the brainchild of Pakistani popstar Haroon. The animated TV series aims to counter Taliban opposition to women’s education through its heroine- a mild mannered teacher who dons a disguise to turn into Burqa Avenger by night, battling local goons to keep her school open. Burqa Avenger is a smart, powerful, subtle, strong Muslim woman. Burka Avenger Episode 01 with English sub-titles from Unicorn Black on Vimeo.